Personal analytics is a hot topic, and Wolfram|Alpha’s Personal Analytics for Facebook is a fun and visual way to understand the hidden patterns in your online social life. They’ve just added some new visualizations about your network and social connectors, so now’s a great time to try it if you’re new to Personal Analytics. Connect with Facebook, sign in for free, and get unique, personalized information and analysis on your social data. You’ll get info on Clustering of your friends… what are the groups of friends that make up your network and how do these groups relate to one another? Check out your weekly activity to see When you use Facebook the most. When are you most active? Discovered if you’re uploading photos and videos, posting links, and/or using apps. Discover where in the world your friends are… like where they live, their hometown, who comes from which country and what that looks like on a map. Find out your network’s global reach… which friends are the furthest from you, who lives closest to the North Pole, etc. 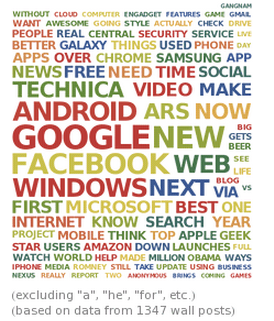 Get a wordmap of what you talk about most on Facebook. The bigger the word is the more often it comes up and is used in your Facebook conversations. “This. Is. Awesome.” – TechCrunch blog comment.